Alianca Stará Tržnica is an NGO managing the Old Market Hall, a historic building in the centre of Bratislava. The building closed down after years of unsuccessful attempts by the municipality to keep the market alive. Years later, the market hall reopened with a redevelopment plan proposed by the Alianca, combining a food market every Saturday with cultural events on other days, as well as two cafés, a grocery shop, a cooking school and a soda water manufacturer. 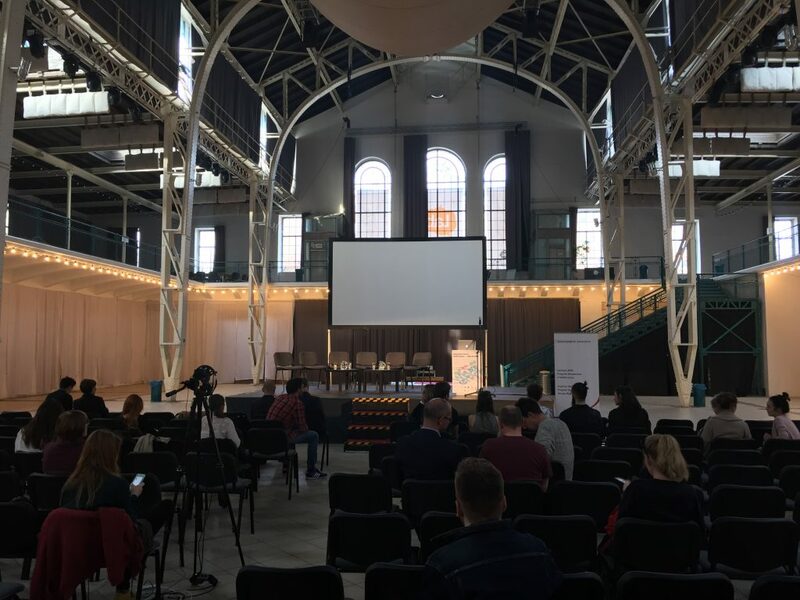 Rethinking the opportunities of the Old Market Hall allows the organisation to run the building in an economically sustainable way, while gradually renovating it and creating a new event venue and meeting space in the heart of the city. How did you start working with the market hall? We are a civic association, the Old Market Hall Alliance, and we have been running the old market hall as a non-profit project since 2013. We addressed the issue of an empty market hall that was closed for years, before we proposed a new kind of redevelopment project to the City. Previously, the City tried to run it as a mono-functional market, but there was only about 6 stalls left inside, and all the others were closed down, so it was not a real market. 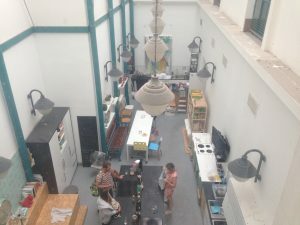 The tenants were there the whole week, not competing with prices, probably even having the same owner, and they did not really generate revenue for the market hall, as the market only had losses, about 30.000 euros a year, without undergoing a reconstruction. The reason this happened was because those managing it had a very narrow focus: a market hall had to be a market hall. But there is no market for a market hall in Bratislava any more. We were thinking we could invent a special program for it. If there is no market for a market hall for seven days a week, we can have a market there one day a week, and can have six days of new programming which could subsidise the market. We brought in a team of experts, eleven people from different disciplines to cooperate on elaborating a new program for the building: it was really important to build a team of people with real hands-on experience, not just one or two leaders. As part of our team for instance, we have someone who has been running concerts for 20 years and knows everyone in the music business and everything to do with running concerts. This way, we do not run into traps. We created a special programme with a flexible forum where you can put any content you want according to your needs and functions: during the week, when there is simply not enough critical mass to attend markets, we use the building as a concert hall, or a ballroom for companies, a conference hall, or a workshop space. So we have the market on Saturdays when people have time, and it is always full of people. On Saturday, the most precious day, we have the market from 8am, always full of people, and therefore Friday night we have no events, because there would not be enough time to clean up. This is a really strong message, that the most precious day is given to the public as a gift. What works is the blend of activities, multi-functionality, to combine functions of those activities that do not generate solid revenue with those that can generate revenue for you: this way you can subsidise the former. How did you come to an agreement with the City Hall? We were lucky, because the municipal assembly voted in favour of our proposal: there were hundreds of people watching the assembly online so there was a kind of public pressure on politicians as well. An important part of our legitimacy was that we managed to communicate this project well: the public understood that this is a project that will serve their purpose. At the same time, we showed the public sector what the value of the project was for them: it was important to show that there is public support, and that it will be perceived in the coming elections. What are the main features of your contract with the Municipality? The whole project was introduced as a sustainable and financially separate project from the Municipality. So we do not receive any subsidies or financing from the city, but pay a symbolic one euro rent per year for the building, and have to invest in the renovation of the market hall. This amount comes to a total of 120.000 euros every year, for the 15 years of the contract’s duration: that amounts to 10.000 euros a month. It is quite a lot of money, especially since we cannot contribute in-kind. On the other hand, we can factor in investments undertaken by our tenants. This constellation brings a direct benefit for the City, as it basically gets 10.000 euros of new investment into the building every month. Another benefit for the City is that we created space for seven new businesses inside the Market Hall, and several more entrepreneurs benefit from the building in one way or another. We cooperate closely with the Municipality. Since the city representatives serve as a kind of a supervisory board, they always check where we can or cannot invest: they have a kind of authority over us. What are your revenue streams to cover the investments? A large portion of our revenue comes from about 16 solely private events per year, which, combined with privately-organised public events, adds up to 60-70%, but this revenue is distributed in a year quite unevenly: the top season is October to December, with plenty of Christmas events, and we have practically no events in July and August. The rent for a private event can run up to several thousands of euros, up to 6.000 euros for a day – for this we provide many services, set up the space, etc. The great demand is due to a specific situation in Bratislava, that there really are not many event spaces of this kind, maybe this is the only one in the centre that is so large and well-positioned, with an easy access for cars. 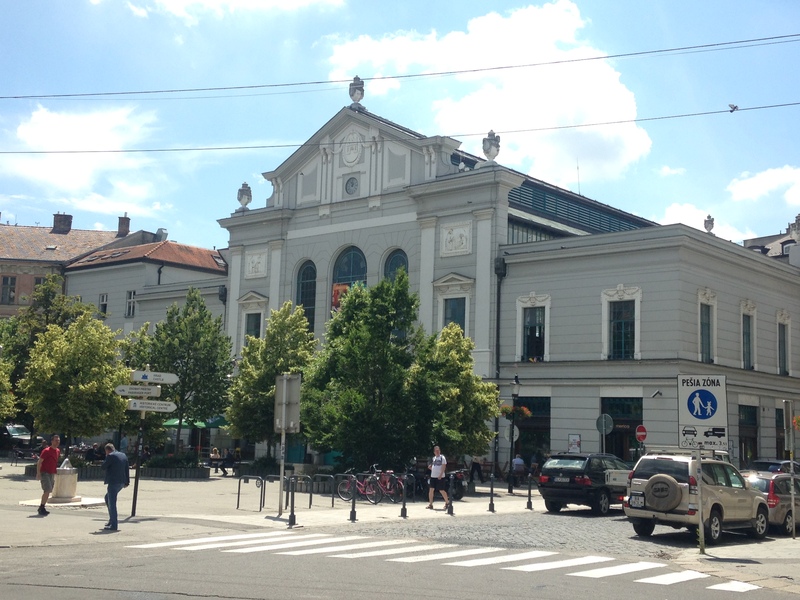 So if you search for a concert hall in the city centre, this would be one of the top choices for you, if you want to make a conference, it is probably the best place in the city centre, especially if you would like to have some kind of community feeling, and do not want to go to a hotel, the market hall would really be your choice – practically you are left with no other choices. How did your economic plan work out? It has been working out well so far. Since we had more revenue than expected, we have already invested 6 or 7 years upfront. It is also because we cannot invest in the building evenly throughout the years: we have to invest more in the beginning. We still have a lot to do in terms of renovation; for instance, we will take a bank loan now to reconstruct the floor that is in the worst condition in the building and will be the most expensive to renovate. Then, we will continue with all the windows, and as the building is a protected monument, it will also be very expensive. We already bought plenty of sound and light equipment, tables for the market and a podium to build the stage, these things are all tied to the construction. Once we have to invest less in the building, and we will have surplus money, we will probably make less and less of those private events that we do not really want to do and make more public ones. And we will have less people working in the market, as we can go down from eleven people working on the building to three people to run the space, the financial person, the event manager and an administrator of the building. What is the function of the smaller spaces of the market hall building? We also use the spaces of the market hall that face the outside, looking at the neighbouring square and streets. The Lab is a fabrication lab, where you can do digital fabrication, use laser cutters, and use the 3D printer. It has a public area and a downstairs workshop with woodcutters and other tools. It works on a prepaid membership basis and contributes to an emerging community around the Lab. There is also a small cafeteria here where anyone can work the whole day by just buying a coffee. We have a restaurant, a sort of a canteen, and they compost all their organic waste. Hopefully, it will emerge into a waste system for the whole market and the neighbourhood. There is also a grocery shop: the idea was to create a locally sourced store where you can find food and products as local as possible. On the other side, there is another café, a social enterprise that has homeless employees as well. Originally, we also had a kids’ centre, for families. It did not work very well, because if you come with kids, usually you do not spend much, and the place was just going down economically. Inside the market hall, there are three more businesses: a cooking school that also makes food for kindergartens, sells to the neighbouring restaurants and works with refugees; a soda producer, in which we are also a small shareholder; and a beer manufacturer. We also organise a bazaar where people can donate things, and the revenue goes for the reconstruction of the building: it does not generate much income but what is important is that it ties the community together. How did you select the tenants? Did you give any priority to social enterprises? We selected the tenants through an open call. The proportion between market and social projects depends on the price you charge per square meters. If you run a market price, then non-market participants obviously cannot take it if they do not receive subsidies. If there is no grant that could help them operate with market rents, then you have to go down, if you want to create social value. What is the relationship between the tenants? Do they compete purely or is there any kind of communication? I do not think there is any strong competition at the moment because they all do something different. There are some synergies, but I do not think they cooperate as well as they could. And even the sourcing is as strong as it could be, but what works quite well, is the grocery store sourcing from our market vendors. There is also a small place for bike delivery service. The concept behind Stará Tržnica is that we reduce the price a little, because we do not do it for profit, and therefore we can have these businesses of social value here. One way of supporting them is to lower the rent, another is that we allow them to deduct certain investments they did, from the rent over the course of ten years. What was your impact on the surroundings? The neighbouring streets have changed dramatically in the last couple of years. Many shops were closed, and the buildings created dead facades. The bars around were only serving elderly men, and now they have become very popular for younger people as well. Aside from the spontaneous effects, we are quite unhappy about some of the squares near the market hall, and created proposals to the City about how they could develop those areas, program, manage and administer them. We already helped revitalise some premises in the neighbouring streets, bringing in new tenants – shops for design, bikes and books – in the ground floor of a quite ruined building adjacent to the market hall. There, we used the same principle as in the market: they invested themselves in the reconstruction, and that was deducted from their rent. We had a concept for the whole building but it was not realised in the end. But it was a model for us to move towards a kind of a niche development: if there is a building where you need to put strong social value, community value, not only economic value, we can provide this. Bratislava, Community, Economy , co-working, commerce, community, English, food, Funding the Cooperative City, heritage, market, renovation, social inclusion, work.